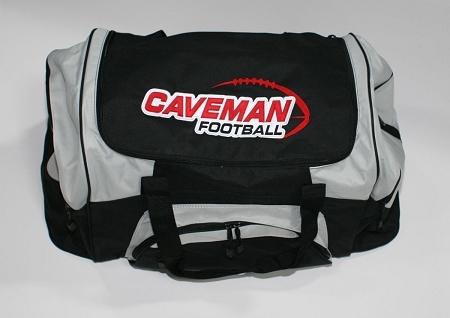 Cavemen - Large Sport Duffel Bag - Embroidered with two color tackle twill applique. Manufactured with 600 denier polyester, includes side and front zippered compartments. Main compartment built with a D-shaped zippered entry for easy access. Padded handle, adjustable and detachable shoulder strap. Dimensions: 13.5"h x 27.25"w x 14.5"d; Approx. 5,372 cubic inches.